This pamphlet from the Da'wa and Guidance Office of Syrian Al-Qaeda affiliate Jabhat al-Nusra, translated by Jawad al-Tamimi, contrasts notably with Islamic State materials. Aymenn Jawad al-Tamimi, a research fellow at the Middle East Forum's Jihad Intel project, writes extensively about the Islamic State (also known as ISIS) and other armed groups in Syria and Iraq. As his writings and translations tend to be too detailed for a general readership, we periodically compile links and summaries for those wishing to learn about the groundbreaking work of this prolific researcher. For all writings by Jawad al-Tamimi, click here. A short op-ed arguing that on-the-ground results of Russia's military intervention "do not show the sweeping victories [Syrian President Bashar] Assad and his backers hoped for." Jawad al-Tamimi disputes the claim that the November 13 Paris terror attacks were a desperate response to military defeats in Iraq and Syria. He notes that these attack "required planning and procurement of provisions predating ISIS's latest setbacks." In any case, he adds, these setbacks "do not represent a decisive shift away" from the stalemate in Syria and Iraq. The author discusses the degree to which the Islamic State's administrative master plan, which he translated for the Guardian newspaper on December 7, is being implemented on the ground. In particular, he cites evidence that the document's call for IS battalions organized around single ethnicities to be folded into integrated military units is being implemented. The author discusses various aspects of the Islamic State's internal nomenclature and historiography, highlighting apparent inconsistencies as to when its "Caliphate" officially came into being. Jawad al-Tamimi examines Quwat al-Jalil, a Palestinian militia fighting with pro-regime forces in Syria (See here for the author's profiles of two other pro-regime Palestinian Syrian militias: Liwa al-Quds in Aleppo province and Jaysh al-Tahrir al-Falastini in the Damascus area). Unlike other Palestinian militias, Quwat al-Jalil claims to have operated on fronts throughout Syria. The author notes recent cases in which forged Islamic State documents have gained widespread traction in outside media reporting and explains how to tell the real from the fake. Most of the forgeries, examples of which are displayed in the article, are poorly produced. "Unlike, say, the realms of sports and Nazi memorabilia, the fakers of Islamic State documents generally do a bad job of trying to convey authenticity." Translation of a musical chant (nasheed) released by the Islamic State's Ajnad Media. Excerpt: "Rain down on them, drive them with tribulations and devastation ... Pour the molten metal with calamities and punishment / And thrust the sharp swords into the foreparts of the head and the necks." "Principles in the Administration of the Islamic State"
The author's translation of a 24-page IS document outlines principles for governing territory under its control, bolstering its military strength, and building a viable state. Topics include healthcare, education, commerce, and combatant training. Translation of a lengthy history of Jamaat Ansar al-Islam, a jihadi group of Iraqi origin that expanded into Syria after the onset of its civil war, published by Abu al-Waleed al-Salafi line-by-line on Twitter in November. See here for Jawad al-Tamimi's early 2014 general overview of the group, here for his account of its Iraq branch's decline due to defections to IS through summer 2014, and here on false claims of the dissolution of the group's Syrian branch in early 2015. Translation of a da'wa [religious outreach] pamphlet by the Maktab al-Da'wa wa al-Irshad (Da'wa and Guidance Office) of Jabhat al-Nusra, the Syrian branch of al-Qaeda. 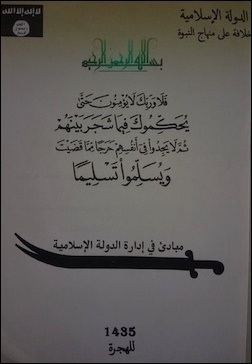 In contrast to Islamic State da'wa materials, the author notes, this pamphlet advocates "a more gradualist approach to implementing Islamic law in society, with the title emphasizing the need for people's hearts to submit willingly to the Shari'a." He also notes that the pamphlet reserves the application of hudud (harsh punishments, like cutting off the hand for thieves and executing adulterers) to rare and exceptional cases, "an implicit contrast" with the Islamic State's widespread displays of hudud punishments in its propaganda. Translation of an Islamic State pamphlet on slavery upon which Reuters has previously reported, but hitherto unavailable in English. 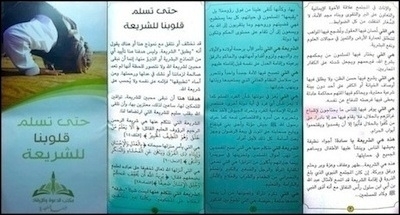 The pamphlet, issued by the Diwan al-'Iftaa wa al-Buhuth (Fatwa Issuing and Research Department), outlines basic justifications for the practice of slavery in areas under IS control, particularly regarding concubines. Aymenn Jawad Al-Tamimi is a research fellow at the Middle East Forum's Jihad Intel project. Related Topics: Iraq, Russia/Soviet Union, Slavery, Syria, Terrorism | Aymenn Jawad Al-Tamimi receive the latest by email: subscribe to the free mef mailing list This text may be reposted or forwarded so long as it is presented as an integral whole with complete and accurate information provided about its author, date, place of publication, and original URL.